Microsoft Outlook is one of the most widely used email and calendar systems. Fortunately MeetingBooster has a dedicated plugin which integrates both emails and calendar appointments affiliated with a MeetingBooster activity. 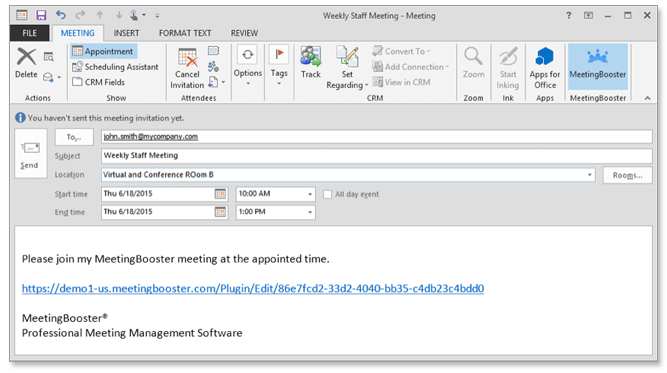 MeetingBooster’s MS Outlook plugin installs seamlessly with your current Outlook system. By following a simple install wizard, users can benefit from a dedicated MeetingBooster tab, and quick links to the most important MeetingBooster features available in Outlook. 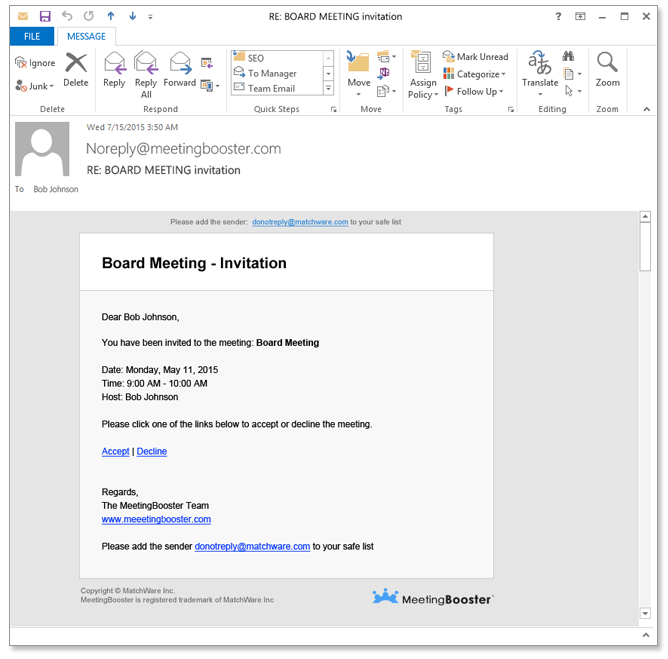 With MeetingBooster’s MS Outlook plugin, meetings can be scheduled and invitations distributed right from Outlook. Simply click on the MeetingBooster tab to schedule a meeting. Since users do not have to change their scheduling habits, MeetingBooster is easy to adopt into any organization with minimal training or resistance. Attendees receive a standard Outlook invitation with the specific MeetingBooster Meeting ID link. If you have an existing MS Outlook calendar appointment, you can easily convert it to a MeetingBooster meeting using the “Convert to MeetingBooster Meeting” feature. By installing the MS Outlook plugin, users will receive MeetingBooster emails letting them know of upcoming meetings, activities and more. Since many professionals already use Outlook to manage their day-to-day, there is a minimal change in habits allowing MeetingBooster to be adopted faster within your organization.